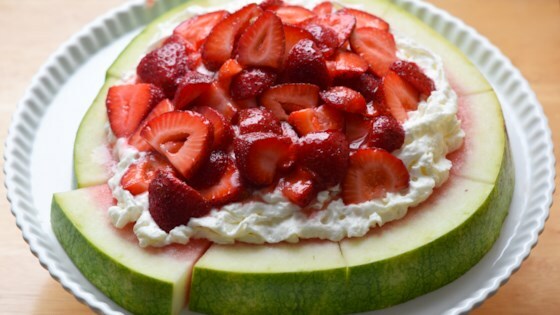 "For a fun take on a classic summer entertaining dessert, try this simple strawberry shortcake watermelon pizza. You can use either store-bought or homemade whipped cream (or try a vegan whipped cream recipe). Either way, the key is to serve this right away as the whipped cream can melt pretty quickly." Mix strawberries and sugar together in a medium bowl until the strawberries are thoroughly coated. Allow the strawberries to macerate for 10 to 20 minutes. Cut the round watermelon slice into 8 wedges, and keep them together. Pat dry with a paper towel or clean dish towel. Spray or spoon the whipped cream onto the center of the watermelon round; don't be afraid to pile it on, as the cream will sink under the weight of the strawberries. Spoon the macerated strawberries and their juices over the whipped cream and serve immediately.